The Vice President of India, Shri M. Venkaiah Naidu has said that Civil Servants should be Empathetic, Efficient, Impartial and Incorruptible and these are the guiding principles that form the bedrock of the higher civil services. He was addressing the gathering after inaugurating the 92nd Foundation Course for AIS & CCS Officers at Dr. Marri Chenna Reddy Human Resource Development Institute of Telangana (MCRHRDIT), in Hyderabad today. The Deputy Chief Minister of Telangana, Shri Mohammad Mahmood Ali, the Director General, MCRHRDIT, Shri B.P. Acharya and other dignitaries were present on the occasion. 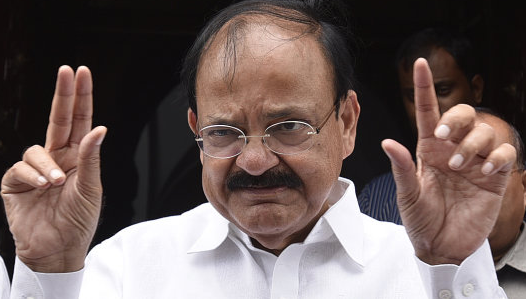 The Vice President said that the credit for establishing India's all India civil services goes to the first Home Minister of India and the iron man Sardar Patel. He further said that the civil servants are binding force and can bridge many divides India faces. We need to use every opportunity to improve quality of life of every Indian, especially those under-served, he added. The Vice President said that civil servants must be impartial with a broad vision for National integration and inclusive development. Serving all without bias by adopting 'Antyodaya' approach as espoused by Gandhiji, Dr. Ambedkar and Deen Dayal Upadhyay must be the motto, he added. The Vice President said that the country expects high levels of performance and integrity from higher civil services and the youth look up to civil servants as role models. He further said that be above board to root out corruption and become the catalyst of a New India. India is a multi-religious, multi-lingual pluralistic society, mother-tongue must be given its due importance, while working with the people, he advised. I am glad to speak with all of you today at the inaugural session of the Foundation course. This course is the foundation for your career and the stepping stone for your future achievements. I congratulate each of you for choosing this career path that will take you through some of the most interesting and challenging opportunities to serve our country. The All India Services have their origin in the conception of ‘Civil servant’used in the British East India Company’s official records in 1765 and it was Governor General Cornwallis who introduced Covenant Civil services (Higher Civil Services) and the Un-Covenanted Civil services (Lower Civil Services). Originally opened to only the British, Indians were allowed to compete for these services after 1870 when the Indian Civil Services Act of 1870 was passed. After India became independent, the founding fathers debated the need to have All India Services and decided that it was necessary to have a civil service that will foster national integration. The credit for establishing the All India civil services in independent India goes to Sri Sardar Patel, the first Home Minister of the country and the great architectof political integration of the entire nation. In post-Independent India, the civil services had to be transformed. From serving foreign masters, the administrators were expected to serve the people in a democratic framework of governance based on the Constitutional provisions. You are all heirs to the legacy left behind by a number of civil servants who had internalized this grand vision of the founding fathers of our nation and the visionary leaders like Sardar Patel. You are about to shape your careers on this strong foundation built over the last seventy years. There have been many changes in the world and the country and consequently you will be working in a different environment as compared to your predecessors. There are, however, some guiding principles that form the bedrock of the higher civil services in the country. These essential well springs must not be allowed to dry up. I shall outline four salient aspects you may like to keep in view: ‘empathy’, ‘efficiency’, ‘impartiality’ and ‘Incorruptibility’. The first is ‘empathy’. Mahatma Gandhi’s advice to anyone who was in doubt if an action was good or not was to put oneself in the situation of the poorest of the poor in the country and see how a particular policy and programme will impact him or her. This is a timeless talisman he gave us which can be a useful thinking tool as you weigh the pros and cons of taking a decision in your career. If the emphasis is on service to the country, the essential quality we may have to imbibe is to better understand whom we are serving- their needs, aspirations and their living conditions. The second principle is ‘efficiency’. As administrators occupying the highest positions of power and authority, you will have an onerous responsibility to translate policies into programmes, to implement schemes on ground. You will be providing that most important link between legislation and implementation. A policy is only as good as its implementation. Very often in our country we keep reflecting on poor implementation of good policies. The tardy, inefficient execution of projects and programmes hurts the common people whom we are trying to serve. The cost and time overruns retard the nation’s developmental progress. We must therefore be constantly mindful of the fact that the country and the people expect the top bureaucracy to deliver at a high level of proficiency and efficiency. You need to be agile in your thoughts and actions. You should be able to access the latest information and knowledge and use them for improving service delivery. There are many civil servants who have made remarkable innovations and transformed sleepy institutions into vibrant hubs of efficient activities. As the work and living environments change, we have to make use of every opportunity to refine our working methods to achieve the ultimate objective of improving the quality of life of every Indian, especially those who have not been adequately served. Innovation is the key. Honest reviews and reflection on what we have achieved and what we have not should be an integral part of our functioning. We must look at the strengths our society offers and how we can build partnerships with civil society and the private sector so that the pace of development can be accelerated and the quality of the services is significantly enhanced. The Prime Minister’s call to ‘Reform, perform and transform’ could inspire you to scale new heights in efficiency and transformational leadership. The civil service was created to provide an impartial inclusive management culture in the country’s governance. This was absolutely necessary in the multi-lingual, multi-religious, pluralistic society that India is. The civil services were the binding force that would be able to bridge the many ‘divides’ that India has. Being impartial and having a broad vision of national integration and inclusive development, the founding fathers thought of the higher civil services as the steel frame of the country. The allegiance is to an inclusive national development as mandated by the Constitution and in accordance with the policies laid down by the legislatures and the parameters of law and justice elaborated the judiciary. The administration must be passionate about service and be dispassionate about the profile of the people we are serving. Serving all citizens equally without any bias or prejudice with a special focus on those who have been left out of the development and growth process should be the direction, the ‘antyodaya’ approach, leaving no one behind, as espoused by Gandhiji, Dr Ambedkar and Deen Dayal Upadhyay, is what you all should adopt. The country expects high levels of performance but also high levels of integrity and rectitude from the higher civil services. The country especially the youth look upon civil servants as role models of good behaviour. The word ‘civil’ is part of the nomenclature of the services and the public at large expects the civil servants to behave in a dignified manner and have the ability to patiently listen and take a balanced view. You must eschew arrogance and authoritarianism and be able to approach even the most intractable issues and irritants with a calm demeanour. Please remember that a corrupt system erodes the vitality of a robust country. If you have to root out corruption and become the catalyst of a new India that we are all aspiring for, you must not only be above board but also appear to be above board. You should avoid all actions that will sully the image of the country and give an appearance to the common man and woman that the avowed ‘steel frame’ has become even slightly bent or rusted. The ‘Iron man’ of India has conceived of the steel frame. I would urge you all to add lustre to this frame by your energetic positive contributions. Make it a stainless steel frame, unsullied, shining and providing the support and glow for illuminating the lives of millions of Indian who are looking for ways to better their lives. Civil servants are binding force and can bridge many divides India faces. We need to use every opportunity to improve quality of life of every Indian, especially those under-served, he added.